The Kenosha Combined Gymnastics team, which went without a Westosha Central representative last year, now has three from the school on this year’s squad. From left: Trinity Alexander, Katy Farrell and Megan Zeller (Jason Arndt/The Report). 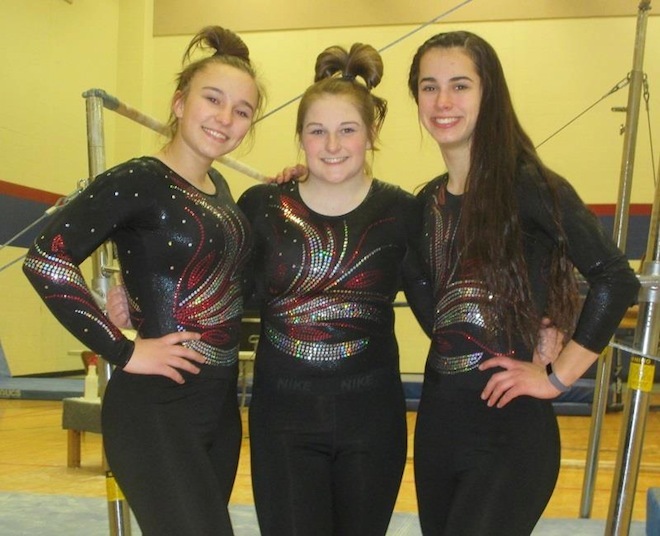 Kenosha Combined Gymnastics, which includes three Westosha Central High School representatives, defeated Waukesha and Antioch in Thursday’s triangular held at Kenosha Tremper. The team, which claimed the top three all-around spots, finished with 138.925 points, more than six points ahead of second place Waukesha. While Grace Corcoran won in three individual events to finish first among all-around performers, Westosha Central junior Megan Zeller placed third, courtesy of a victory in the vault. Zeller, who notched a 9.225 in the vault, also placed third in the uneven bars at 8.30 and had a fourth place finish in the floor exercise where she obtained an 8.65. For other Westosha Central representatives, junior Katy Farrell scored a 7.975 in the vault. Trinity Alexander, a sophomore, had a 7.750 in the uneven bars and scored a 7.75 for her floor exercise. The Report will have a full feature on the Westosha Central participants in an upcoming print edition. Team scores: 1. Kenosha 138.925, 2. Waukesha 132.275, 3. Antioch 107.9. Uneven Bars: 1. Grace Corcoran, KCG, 9.00; 2. Maggie Losch, KCG, 8.40; 3. Megan Zeller, KCG, 8.30; 4. Brooke Lytle, WAU, 8.275; 5. Erin Wagner, WAU, 8.150; 6. Hannah Rose, KCG, 8.125; 9. Trinity Alexander, KCG, 7.750. Vault: 1. Megan Zeller, KCG, 9.225; 2. Maggie Loech, KCG, 9.025; 3. Jami Balicki, WAU, 8.80; 4. Brooke Lytle, WAU, 8.600; 5. Sarah Pascavis, WAU, 8.375; 8. Hannah Rose, KCG, 8.10; 10. Katy Farrell, KCG, 7.975; 11. Grace Corcoran, KCG, 7.85. Balance Beam: 1. Grace Corcoran, KCG, 9.075; 2. Angelina Riley, KCG, 9.00; 3. Erin Wagner, WAU, 8.775; 4. Maggie Losch, KCG, 8.65; 5. Megan Zeller, KCG, 8.575; 9. Shania Bramsley, KCG, 7.825. Floor Exercise: 1. Grace Corcoran, KCG, 9.15; 2. Maggie Losch, KCG, 8.875; 3. Angelina Riley, KCG, 8.70; 4. Megan Zeller, KCG, 8.65; 5. Brooke Lytle, KCG, 8.525; 8. Trinity Alexander, KCG, 7.725. All-Around: 1. Grace Corcoran, KCG, 35.075; 2. Maggie Losch, KCG, 35.05; 3. Megan Zeller, KCG, 34.75.